Research shows that people who plan carefully for big purchases, like owning a home, are less likely to run into financial trouble later. So if you are thinking about buying a home this year, let’s make a plan. The first step: Check your credit. It’s always a good idea to review your credit reports and scores periodically, even if you’re years away from shopping for a home and a mortgage. If you’re planning to buy a home this year, we recommend checking your credit reports and scores as soon as possible. The better your credit history, the more likely you are to receive a good interest rate on your mortgage loan. Lenders will use your credit reports and scores as important factors in determining whether you qualify for a loan, and what interest rate to offer you. If there are errors on your credit report, you may have trouble qualifying for a loan. So, don’t delay in checking your credit. Review your credit reports and take steps to fix any errors. It’s the first step to building a strong financial foundation for your new home. A credit report contains information about your credit such as the status of your credit accounts and your payment history. Lenders use these reports to help them decide if they will loan you money, and at what interest rate. Credit reporting agencies (also known as credit reporting companies or credit bureaus) compile these reports. Credit scores are calculated using a mathematical formula—called a scoring model—that companies and lenders use to predict how likely you are to pay back a loan on time. Your credit scores are calculated from the information in your credit report. 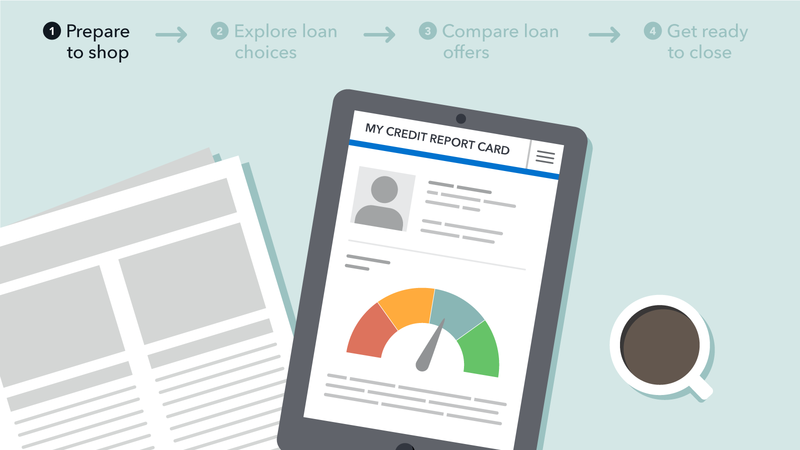 Here’s a step-by-step guide to getting, reviewing, and understanding your credit reports. 1. Request your free credit report online or over the phone. There are three major credit reporting companies – Equifax , Experian , and TransUnion . Each company maintains a separate report. You have the right to a free copy of your credit report once per year from each of the three companies at www.annualcreditreport.com . You can also call 1-877-322-8228. If you review your credit report from one of the major companies every four months, you can get a good idea of your credit throughout the year at no cost. However, if you are planning to start the homebuying process within the next six months to a year, you may want to request and review all of them at once to check for errors or issues. Checking your credit report will not hurt your credit score. Your free credit report does not include your credit scores – keep reading to learn how to check your scores. 2. Review your credit report. Once you get your credit report, you will want to review it carefully. Ordering it is not enough — you have to read it. Credit reports may have mistakes. And if there are mistakes, you are the one who is most likely to find them. Incorrect information can appear on your report because the credit bureaus processed the information incorrectly or because lenders or debt collectors sent flawed information to the credit bureaus or did not update the information they previously reported. Incorrect information may also be a result of fraud, such as when someone uses your identity to open accounts or takes on debt without your knowledge. You should review your credit report for any errors or fraudulent activity. Look at the section labeled “inquiries that may impact your credit rating” or “inquiries shared with others.” Are there any companies listed that you don’t recognize? This section should only include companies that you have applied for credit with in the past two years. Inquiries listed in sections labeled “inquiries shared only with you,” “promotional inquiries,” or “account review inquiries” do not impact your score. Are there accounts placed in collection that you don’t recognize or that are more than 7 years old? Are there public records such as civil lawsuits, judgments, or tax liens that you don’t recognize or that are more than seven years old? Are there bankruptcies that are more than 10 years old? With each credit report you get, use this checklist to help you review and check for errors. You can use our printable “Credit Report Review Checklist” to help you review each section of your credit report. We recommend using this worksheet for each credit report you get throughout the year. Then, keep the completed checklist with your credit reports. 3. Report any errors, fraudulent activity, or outdated information. If you find errors or fraudulent activity after your review of your credit report, you have the right to dispute inaccurate or incomplete information. Keep in mind that there’s a difference between inaccurate or incomplete information and negative but accurate and complete information. Both can lower your credit score, but a credit reporting company will only correct information that is inaccurate or, incomplete, or outdated. To dispute an error, you should contact both the credit reporting company and the company that provided your information to the credit reporting company. For example, if you review your report and find a listing for a student loan you never took out, you should contact both the credit reporting company that provided the report and the student loan company listed. Be sure to include supporting documentation with your disputes to both companies. The companies must conduct an investigation and fix mistakes as needed. The three major credit reporting companies provide instructions for filing a dispute online: Equifax , Experian , and TransUnion . You can also submit a dispute by phone or paper mail. The Miss April provides a sample dispute letter that you can use if you want to submit your dispute by mail. Get more tips and contact information to dispute an error on your credit report. Beware of any service that says it can dispute inaccuracies for a fee. You have a legal right to dispute inaccuracies yourself, at no cost. If you find an error on one of your credit reports, check your credit reports from all three reporting agencies. Lenders operate differently from one another, so while one may pull your Experian report, another might pull your TransUnion or Equifax report. It’s important to make sure they’re all accurate. If you find outdated negative information on your credit report, contact the credit reporting company and ask that it be removed. Bankruptcies are considered outdated if they are more than 10 years old. Most other negative information is considered outdated if it is more than 7 years old. A credit score is a number based on information contained in your credit report. You don’t have just one credit score. There are many credit scoring formulas, and the score will also depend on the data used to calculate it. Different lenders may use different scoring formulas, so your score can vary depending on what type of score the lender uses (a mortgage score or an auto score, for example). Today, most mortgage lenders use a FICO score when deciding whether to offer you a loan, and in setting the rate and terms. Your FICO score will differ depending on the credit bureau and FICO scoring model your lender uses – so you have an Experian FICO score, an Equifax FICO score, and a TransUnion FICO score. Also, be aware that your score changes as the information in your credit report changes. Your payment history: How you’ve handled loans and credit cards. This category includes details about whether you’ve made payments on time, missed payments, or had accounts in collection. How much you owe: The amount of debt you’re carrying compared to your available credit line or the original loan balance. Length of credit history: How long you’ve been borrowing money. Credit mix: Your history managing different types of loans. New credit: How many accounts you’ve applied for or opened in the past six to twelve months. Most FICO scores range from 300-850. A higher score makes it easier to qualify for a loan and may result in a better interest rate. As of March 2015, the median FICO score nationwide was 721. The best rates go to borrowers with credit scores in the mid-700s or above. For more tips on how to get and keep good credit, visit Ask Miss April. Doesn't checking my credit hurt my score? When you request your own credit report, those requests will not hurt your score. Check your credit card or other account statement (free). Many major credit card companies and some banks and credit unions have begun to provide credit scores for all their customers on a monthly basis. The score is usually listed on your monthly statement, or can be found by logging in to your account online. Talk to a non-profit counselor (free). Non-profit credit counselors and HUD-approved housing counselors can often provide you with a free credit report and score and help you review them. A counselor may also be able to help you with the homebuying process. Buy a score (comes with a fee). You can buy a score directly from the credit reporting companies. You can buy a FICO credit score at myfico.com . Other services may also offer scores for purchase. If you decide to purchase a credit score, you are not required to purchase credit protection, identity theft monitoring, or other services that may be offered at the same time. Credit score services (can come with a fee). Many services and websites advertise a “free credit score.” Some sites may be funded through advertising. Other sites may require that you sign up for a credit monitoring service with a monthly subscription fee in order to get your “free” score. These services are often advertised as free trials, but if you don’t cancel within the specified period, you could be on the hook for a monthly fee. Before you sign up for a service, be sure you know how much it really costs. Borrowers with credit scores in the mid-600s range and below generally pay the highest rates and have the fewest choices. Borrowers in this range may have trouble qualifying for a loan, depending on the loan type and the specific lenders. If your score is in this range, you may want to meet with a housing counselor and explore your loan options to decide whether you want to go ahead now or work to improve your credit before applying for a mortgage. In 2013, only four percent of homebuyers taking out a mortgage had scores less than 620. The loans available to borrowers with credit scores less than 620 often have very high interest rates and risky features. If your score is in this range, you may want to improve your credit before applying for a mortgage. A non-profit credit counselor or HUD-approved housing counselor can help you make a plan to improve your credit. If you are looking to improve your credit, beware of anyone who claims that they can remove negative information that’s current and accurate from your credit report. This could be a credit repair scam. You can’t get negative information removed from your credit reports if the information is current and accurate, but you can take steps to rebuild your credit. There are no shortcuts to building good credit history; it takes time and making regular, on-time payments to your accounts. Learn more about getting and keeping a good credit score. If you are in the market to buy a home, lenders will use your credit scores to decide whether they’re willing to lend to you and at what interest rate. Don’t apply for any more credit than you absolutely need. If you can, avoid applying for new accounts or adding significantly to your debt. Your credit score may decline if you have too many new account requests or too much new debt. However, when you request your own credit report, those requests will not hurt your score. And when you shop for a mortgage with multiple lenders, the additional credit checks won’t hurt your credit so long as they happen within a short window of time, roughly 45 days. Remember that everyone, regardless of credit score, has the right to shop around for the best mortgage for their financial situation. Checking your credit history, fixing any errors, and knowing your credit scores will put you in the best possible shape for getting a mortgage. Ask us questions. We’ll feature some of the most frequently-asked questions on our blog this spring.